Set out on a summer wildlife adventure through Canada’s northern reaches, witnessing beluga whales as they gather at the mouth of the Churchill River, searching for polar bears on shore and discovering the history of the Hudson Bay fur trappers. Arrive in Winnipeg, where you are transferred to your hotel. Gather tonight for a welcome dinner. Begin your day at the Assiniboine Park Zoo, going behind the scenes for an up-close perspective of its exhibits. Get an insider’s look at the research facilities as well, learning about critical efforts underway to help the Canadian polar bear population. Afterward, tour bustling Winnipeg, capital of the prairie province of Manitoba. Enjoy lunch at leisure before journeying to FortWhyte Alive, where you encounter mighty bison and learn how they influenced local history. Then, paddle a voyageur canoe used by fur trappers; explore a Plains Cree tipi; and step into a one-room sod house, where you sip wild bush tea and taste bannock cooked over a campfire. 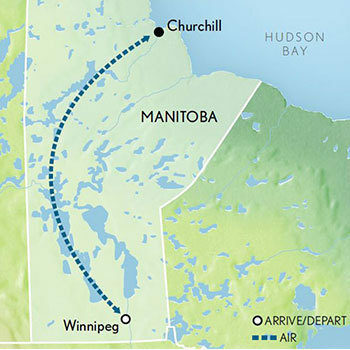 Fly by charter air to Churchill on the shores of Hudson Bay. Check in to your rustic lodge, constructed by hand with trees salvaged from a forest fire. After lunch, a local expert reveals Churchill’s intriguing heritage. See the cargo aircraft wreck of “Miss Piggy,” and visit the “polar bear jail” for a sense of what it’s like to have wild bears at your doorstep. Later, head to the nearby boreal forest to meet a local dog musher and his pack. After learning about this time-honoured form of transportation, take a spin along a forest trail. Embark on an extended boat trip to Hudson Bay, keeping close watch as your captain tries to locate polar bears, beluga whales and other wildlife along the coast and in the bay. If conditions allow, disembark to explore the bear’s summer habitat. Return to Churchill for an evening at leisure. Cross the Churchill River to the Prince of Wales Fort, a former outpost of the Hudson’s Bay Company. During the summer, the waters here are home to thousands of beluga whales; thrill to up-close views of these friendly mammals from a sturdy Zodiac. Later, join your lodge chef to discover abundant local fish during a hands-on cooking class. Today, a massive “Arctic Crawler” super-bus carries you into the wilderness in comfort and safety. Keep watch for eagles, bears and other wildlife, then walk across the coastal flats at low tide to explore the ‘Ithaca,’ which ran ashore during a 1961 storm. Experience beluga whales, again, choosing to either see them by kayak or during an exciting AquaGliding excursion. Tonight, feast on a hearty meal at your lodge. Visit the Churchill Northern Studies Centre, where you learn about the role it played during the Cold War-era space race and hear about crucial scientific research being conducted today. A charter flight returns you to Winnipeg. This evening, visit Dalnavert House, built by Hugh John Macdonald, son of Canada’s first prime minister and the then-Premier of Manitoba. Enjoy a private tour and reception before sitting down to a special farewell dinner.